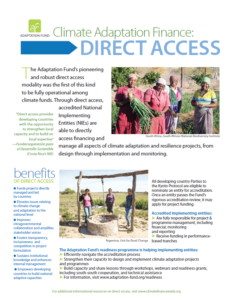 The Adaptation Fund pioneered fully operational direct access to climate financing. 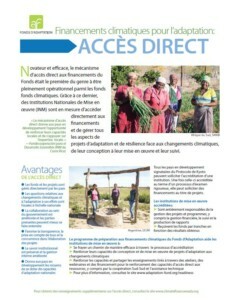 Through direct access, National Implementing Entities are able to directly access financing and manage all aspects of climate adaptation and resilience projects, from design through implementation to monitoring and evaluation. In 2014, it launched the Readiness Programme for Climate Finance, designed to capture and share the growing experiences of AF direct access and other climate finance in order to strengthen the capacity of national and regional entities to receive and manage climate financing. 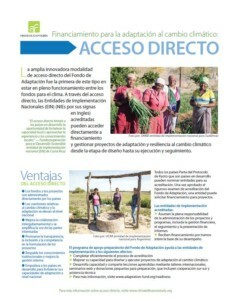 Check out – and download or print – our info sheet about the Adaptation Fund’s Direct Access or watch the video about Direct Access experiences.